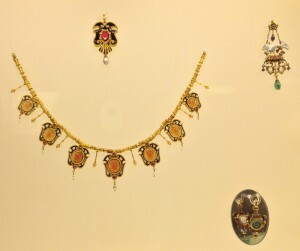 Two of the most common metals used in jewelry, silver and gold have colorful pasts and lots of varieties that can be difficult to understand. Let’s try to unravel the history and the mystery. This element, called argentum by the Latins (which explains the Ag symbol on the periodic table), was discovered in approximately 4000BC. 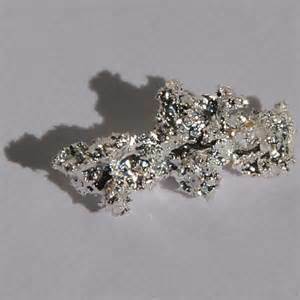 The word argentum means “white and shining.” Silver was the original white metal. It has been mined in many places on Earth, including the United States. This metal has also been used in jewelry for thousands of years. It has always been a symbol of wealth and stature. The ancient Egyptians worked gold into jewelry. So did the Chinese, as early as 1100BC. 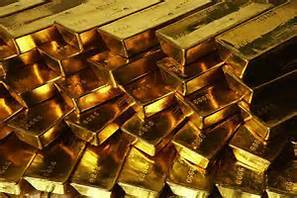 While gold was originally found in the Middle East, today most of the world’s gold production is in Africa. Other gold-producing countries are Australia, Brazil, Canada, China, Russia, and the United States. Pure gold, 24 karat gold, is very soft. It’s alloyed with other metals to enhance its hardness, strength, and character. Typical alloys are 10 karat (41.7% gold), 14 karat (58.5% gold), 18 karat (75% gold), and 22 karat (91.6%). The karat mark will be on an inconspicuous place on your jewelry. Here in the U.S., for example, 14 karat gold would be stamped with 14K or 585. 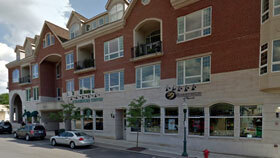 Gold is usually mixed with metals that will enhance the color desired in the final product. So white gold is alloyed with white metals like nickel, palladium, silver or zinc. Rose gold is alloyed with copper. Not all gold jewelry is karat gold. 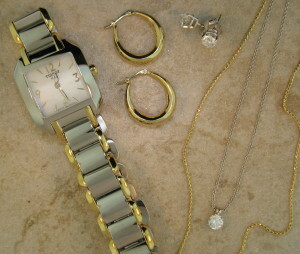 Less expensive fashion pieces can be gold plated, vermeil, or gold-filled. These are all different, even though sometimes they are seen as interchangeable. Electroplating is a process that coats the gold over a piece of jewelry made with nonprecious metals like iron or nickel. The gold plating is very, very thin–only microns thick–and eventually wears away. Vermeil is gold plated over sterling silver rather than a base metal. The thickness of the plating is at least 2 microns. But when a single human hair is 50-100 microns thick, you know just how thin that plating can be. Gold-filled jewelry has approximately 100 times more gold than a gold-plated piece. 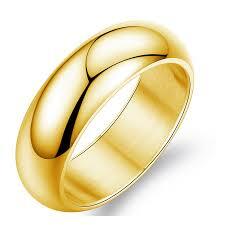 The gold is bonded over brass or another base metal. It’s usually stamped as 14K G.F. and will not wear off like gold plating. There is so much to know about metals. This really just touches the surface. The important thing to remember is that not all metals are equal. The purer the metal, the more valuable it will be. So when you’re buying jewelry, be sure of the metal(or metals) it’s made of. What’s the difference between carats, karats, carrots, and carets? They all sound the same, but they have very unique meanings. And two of them, carats and karats, are commonly used words in the jewelry industry. 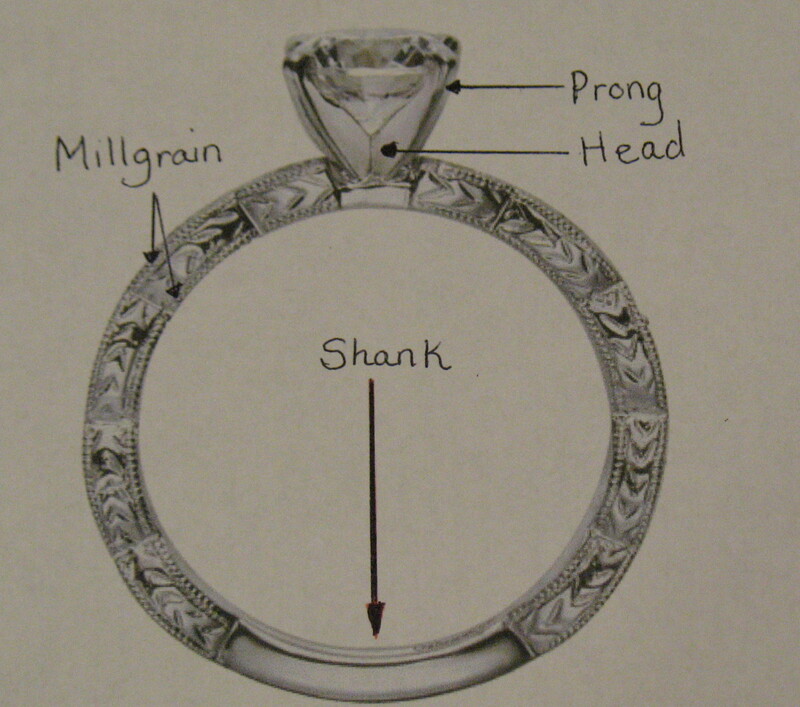 Used to describe the mass of a diamond and other gemstones, a carat is a measure of weight. One carat is equal to 0.2 grams or approximately 0.007 ounces. The name, carat, comes from ancient times when carob beans were used on a balancing scale to measure the weight of light objects like gemstones. A carob bean doesn’t weigh much but, more importantly, carob beans are very consistent in their weight and size. Each one weighs about 0.007 ounces (about the same weight as a paperclip). Another way to think about it is that it takes about 142 beans to make one ounce. Historically, weighing light objects wasn’t done consistently. The carob bean was used throughout the Middle East and Europe. Grains of wheat or rice were used elsewhere. And the carat was used to weigh other things besides gemstones. 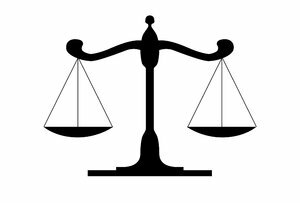 There wasn’t a standard carat weight that was used in all countries. But in 1907, the 4th General Conference on Weights and Measures adopted the “metric carat”, equal to 0.2 grams or 200 mg, as the official and world-wide measurement for diamonds and gemstones. 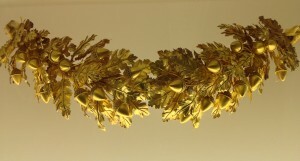 The term, karat, is usually used to indicate the fineness of a gold alloy. It is a measure of purity. Twenty-four karat gold signifies 100% pure gold. So, using your knowledge of fractions, you can determine that 18 karat gold has 75% gold and 25% other metals. (You can also see my previous blog on metal alloys.). Fourteen karat gold has 58% gold and 42% other metals. Interestingly enough, the measure, karat, came from the German carat. The Germans had a gold coin, called a “mark”, which weighed exactly 24 carats (4.8 grams). The purity of the gold in the coin was expressed as the number of carats of gold present in the 24-carat coin. Somehow, the letter was changed from “c” to “k” and the karat was born. 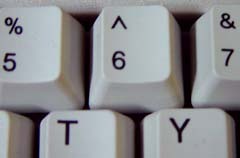 So, what about “caret” and “carrot?” Well, a caret is a wedge-shaped symbol indicating the place where something is to be inserted. And a carrot? 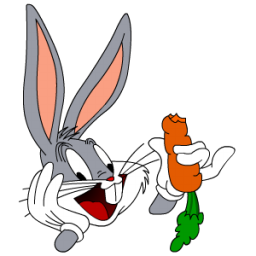 Well, I’ll let Bugs Bunny explain that one. STACKABLES are in fashion! People like to stack bracelets, necklaces, and even rings. This trend has led to thinner, smoother styles that stack easily. The picture above features “bamboo” bangles from Thistle and Bee. The agates and topaz stones can be easily offset so the bangles fit nicely together. In reading articles from Huffington Post and Harper’s Bazaar, I learned that stacking is rather an art form. It strives for a carefree feeling, fun and not too heavy. If you are stacking necklaces, stick to thinner chains, smaller pendants or charms, and only a few small stones or beads. It’s best if you stagger the lengths and not wear anything too chunky. If it’s rings you want to stack, try mixing metals and textures. 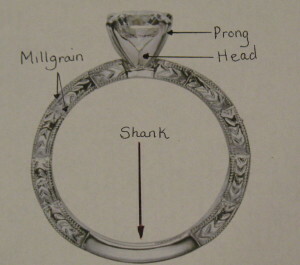 Again, it’s best if the rings have flat edges and small, single, or no stones. Keep your stacked rings to one finger per hand. It’s just as important to have fingers bare, so that the eye goes to the stack. Bracelets, on the other hand, can be wide and bold. The more, the merrier with these! You can dress up both arms and stack them to your elbows if you want. Mixing a couple of different metals is fun, and using different shapes and thicknesses is preferred. The main caution is to minimize other types of jewelry if you’re wearing a lot of bracelets. ROSE GOLD is quite the rage! This alloy of gold and copper is not just for the strawberry blonde. Some people say it looks great on those with a warm skin tone–think peaches and autumn. But other people say it looks wonderful on those with a cool skin tone–think strawberries and summer. Obviously, rose gold is a lot more versatile than one might think. Rose (or pink) gold looks fabulous with the vintage ring styles that are popular right now. 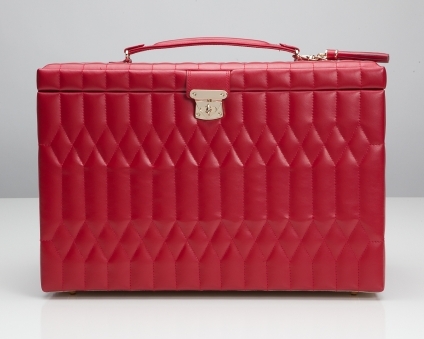 It has a delicate femininity that coordinates with the vintage look. CIGAR BANDS are an up and coming trend, according to David Connolly. 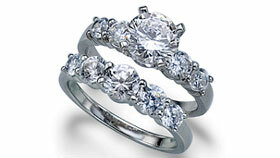 These are wider than the traditional wedding band, and they can be ornate or simple. Think of years back, when men proposed to the women they loved with an actual paper cigar band! Years ago we had a client who kept the paper her husband had used to propose and, decades later, had us custom make a gold version of it. She was ahead of her time! Or maybe it’s just that trends operate with the “what goes around, comes around” philosophy. Trends are fun to observe, even if you don’t want to follow them. They are more obvious if you know what to look for. For instance, the Pantone Color of the Year is Marsala, so make sure to look for it this fall! If you pay attention to people’s jewelry, you’ll see more stackables and rose gold. Have fun and don’t forget to see our selection of rose gold and stackable jewelry! 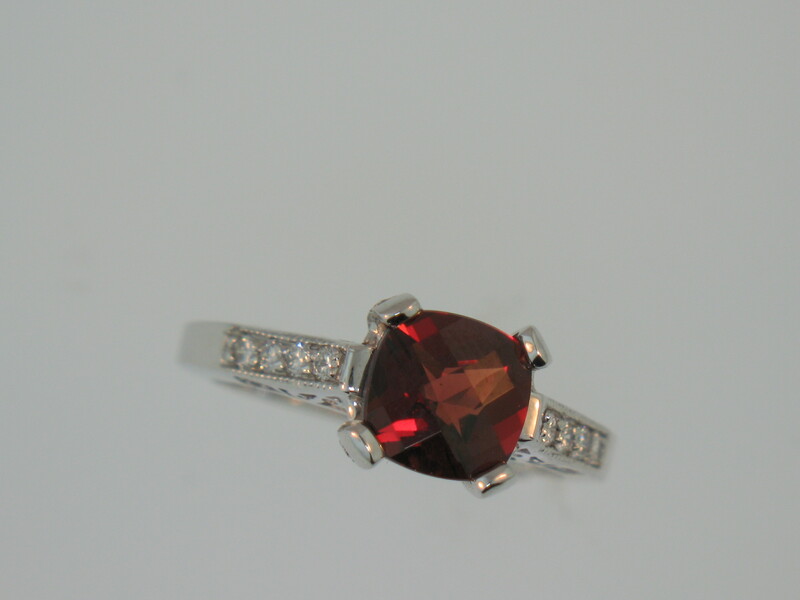 January’s Birthstone–Garnets are Great! Why? Garnets have a lot to offer those of you born in January or with loved ones born this first month of the year. One important quality of a garnet is the wide selection of colors it comes in. 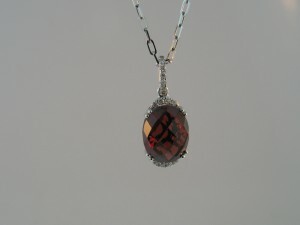 Traditionally, the January birthstone has been a deep red color, almost brownish red. Not everyone likes that brownish hue, although Pantone has named “Marsala” as the 2015 color of the year. The term, garnet, however, refers to a whole group of minerals with many species and varieties. If you like a softer red with a purplish hue, try a Rhodolite garnet. 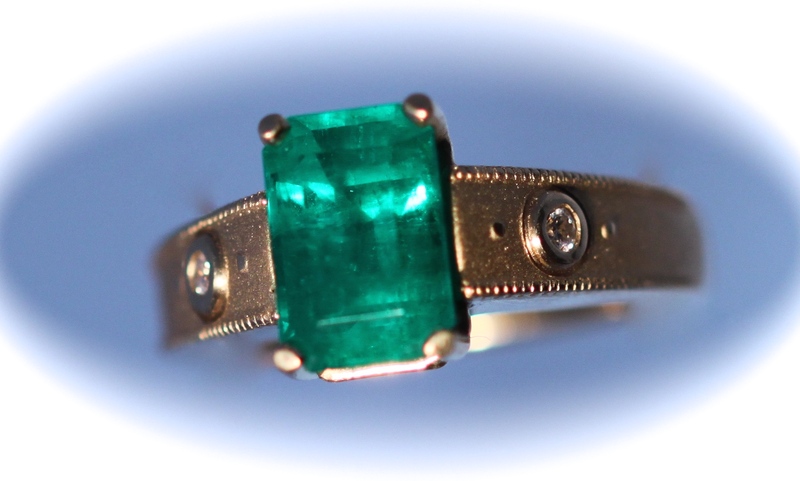 If you want a bright spring green, go for a Tsavorite (sah-vuh-rahyt) garnet. And, if orange is your color, there’s always a Spessertine (sometimes called Mandarin) garnet. Another great aspect of garnets is their affordability. Compared to other birthstones, like April’s diamond, May’s emerald, July’s ruby, or September’s sapphire, garnets are an absolute bargain! Why is this so? Well, it’s partly because there is an adequate supply that meets demand. Garnets are mined in many places including Sri Lanka, Madagascar, East Africa, India, China, Australia, Brazil and the U.S. I also think garnets suffer from a lingering bad reputation they acquired from their common use in Victorian times. The Bohemian jewelry that was so popular then looks dark and dated to us now. Over a century later, the deep red garnets are less expensive than other colors of the group. Finally, for those of you who are concerned about the enhancements done on many fine gemstones–whether it’s heat treatment to improve color or fracture filling to improve clarity–rest assured that garnets come to the market without such common enhancements. Their color, high refraction, and lack of eye-visible inclusions are all natural. If you think of gemstones as kids in the classroom, Garnet is the easy-going, good-looking one who never asks for special treatment. Why wouldn’t you want to make friends with a garnet? 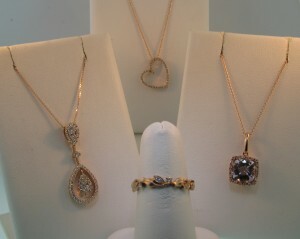 Above are some of the pieces we have in stock at Dearborn Jewelers. If you’re interested in a green, orange, or any other color of garnet, just let us know and we can order it for you. Remember Chemistry class and the periodic table of the elements? Science wasn’t my favorite subject, but, as an adult, I’ve grown to love gemstones, and they’re usually set in metals found on the periodic table. Gold (Au), silver (Ag), and platinum (Pt) are the primary metals used in fine jewelry. You’ll see titanium (Ti) and tungsten (W) used for men’s wedding bands, and rhodium (Rh) often plates white gold and silver jewelry. Much has been written about the pros and cons of each metal. If you are in the market for engagement and/or wedding rings. I would encourage you to ask questions and even do your own research on which metal(s) is right for you. The knowledgeable staff here at Dearborn Jewelers is happy to answer your questions, and we often share our favorite metals chart with customers. But jewelry uses alloys (a mixture of two or more metals) rather than pure gold, silver, or platinum. Gold, which needs other metals to provide hardness, reduce malleability, and add color, often has a complicated recipe that includes combinations of nickel (Ni), palladium (Pd), copper (Cu), zinc (Zn), silver (Ag) and, possibly tin (Sn) or manganese (Mn). Sounds like cooking, doesn’t it? Much more fun than chemistry. What’s interesting is that there isn’t a set recipe for making, for example, 18 karat white gold. The only major requirement is that 18 of the 24 parts, or 75% of the alloy, be gold. What about the other 25%? Any good cook would say that’s way too high of a percentage to be ambiguous about. For one thing, not all the potential ingredients are equal. Approximately 1 in 10 women are allergic to nickel. Some women are allergic to copper. 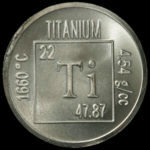 Palladium, being another metal in the platinum family, is a rare, white, hypoallergenic metal, making it a good substitute for the white nickel. But it’s much more expensive than either nickel or copper. Nickel and copper sell for a few dollars per pound, while palladium sells for hundreds of dollars per ounce! Another interesting fact about white gold is that much of it is rhodium-plated. While the plating makes the jewelry whiter and shinier, and it provides some protection from an adverse nickel reaction, this plating will wear off of rings worn regularly. It needs to be re-applied every year or two. If you want to know exactly what’s in your white gold ring, what’s underneath the rhodium “frosting”, you’ll have to ask. I saw recipes that range from 75% gold, 20% palladium, and 5% silver to 75% gold, 10% copper, 8% nickel, 4.5% zinc, and 2.5% silver. While I’ve used 18 karat white gold to make my point, this variation does exist in the making of other alloys as well. At the same time, platinum alloy is 90 to 95% platinum and sterling silver is 92.5% silver. So there’s not as much variation. In the end, choosing the metal that’s right for your engagement or wedding ring depends, in part, on the recipe. anniversary ring together, following a few basic steps. We pulled out the post-it notes and some wine and brainstormed about what our marriage meant to us. Big things and little things. . .no answer was refused. . .until our brains felt empty of ideas. our marriage meant. The goal was to consolidate to one or two broad themes. instead of writing on them. But, after several iterations, a ring began to take shape. next 30 years. Every time I look at that ring, I see the symbol of our life together.